Osorno and Ormbsy peer into the world of topology. Imagine an elastic, rubbery world where baseballs can be stretched into spaghetti, and coffee cups squeezed into wedding rings. Where our familiar intuitions about shapes, points, and proximity are given rigorous mathematical definitions—and then turned inside out, distorted into an alien universe of dazzling symmetries and dark infinities. Reed math professors Kyle Ormsby and Angélica Osorno have won a monster $368,000 grant from the National Science Foundation to explore this emergent field (pronounced HOME-uh-topy), which is populated by strange mathematical entities such as Hopf fibrations, Burnside rings, and infinite loop space machines. 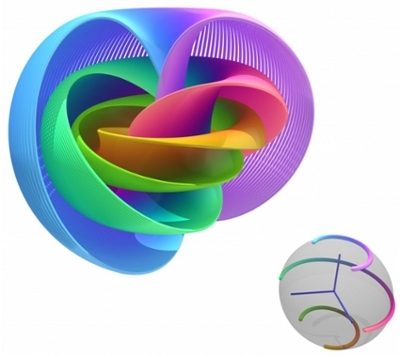 In particular, they hope to cross-pollinate two distinct branches of the discipline—equivariant homotopy theory and motivic homotopy theory. “We hope to use insights from each field to bear on the other,” says Prof. Ormsby. The full power of the field is only now being harnessed; equivariant homotopy theory was actually used in 2011 to crack a major problem in topology known as the “Arf-Kervaire invariant problem.” In fact, some of the most prominent researchers in homotopy theory will come to Reed in August for a conference titled “Homotopy Theory in the Ecliptic,” for which Reed won a separate grant from the NSF. The NSF grant will also give students the opportunity to pursue their own research projects over the next few summers, potentially adding to the impressive list of student publications from Reed’s math department.